LG SK8 Dolby Atmos soundbar review | What Hi-Fi? If there were an award for consistency, LG’s soundbars would be likely winners. But unfortunately, that consistent run has been one of very average form over the years. There was light at the end of the tunnel though, as we rated the previous LG soundbar we tested – the high-end LG SK10Y – above par, thanks to its effective Dolby Atmos presentation. So is the SK8 another trend-bucking soundbar from the Korean giant? At half the price of the SK10Y, but with the headline feature of Dolby Atmos support, it seemed tempting. However, we soon discover that the SK8, like its Sony HT-ZD9 rival, suffers a glaring omission: upward-firing drivers. Instead it attempts to direct sound upwards through a 2.1 configuration of front-facing drivers. The logic of a ‘2.1 Dolby Atmos soundbar’ is lost on us too, but the SK8’s processing is designed to create a ‘virtual’ overhead sound experience worthy of the Atmos name. 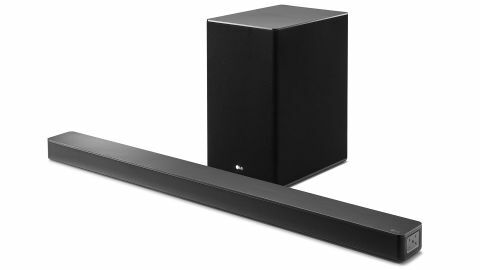 The SK8’s similarities to other LG soundbars also extends to aesthetics. The bar – more or less the length of a 55in TV – is finished in a sleek metallic grey, and the fact it’s a fair few centimetres shallower than the SK10Y should please those who don’t have much spare room on their AV rack. Meanwhile, the wireless subwoofer is bookshelf-speaker-sized and you shouldn’t struggle to find it a home on the floor near to the bar. It’s worth noting that while HDMI, optical and 3.5mm inputs are offered on the soundbar’s rear panel, Atmos content can only be played with a HDMI connection. You can tell whether it’s receiving an Atmos signal by pressing the ‘info’ button on the supplied remote – the bar’s LED display will flag it. The visual is loud and clear on the display when we play Dolby’s familiar Atmos-showcasing clips, which are good indicators of a product’s Atmos ability. The LG’s impressive breadth and dimension is apparent from the first clip (‘Amaze’) as the sound of birds flying spans the screen and beyond. There’s plenty of spaciousness too, the bar’s tweeter and four drivers doing a fine job of pinpointing details and putting space between them. As you may expect from its speaker configuration, though, it doesn’t capture that sense of height. The rain effects, which in an ideal Atmos set-up would sound as though it’s falling overhead, remains very much in front of you – and that’s the case with spaceships flying overhead (in ‘Horizon’) too. It’s not just the bar that plays its part. While not the punchiest, the subwoofer ensures there’s no paucity of bass weight and is key in providing ample clunk and boom when the Kingsman blows up or when the chairlift crashes through satellite poles. Ultimately, it’s hard to forget that the bar is in front of you. We play the lasso bar brawl scene in Kingsman: The Golden Circle, and though it’s a more involving experience than offered by the film’s TrueHD soundtrack, thanks to its generous width and depth, without the height and rear presence the scene doesn’t quite sound like a “tornado in a trailer park”, to quote Agent Whiskey. Still, it has no problem filling our room and dollops of clarity, particularly through the midrange, help ensure what we hear is squeaky clean. Dialogue carries decent detail, easily identifying the mix of accents within London’s Kingsman and Tennessee's Statesman. Mechanical effects, alarm systems and the subtle sound of pulling guns out of holsters are all present, and the thematic Take Me Home, Country Roads instrumental clearly rears its head beneath action and dialogue as it should. Credit to LG’s tuning, the ‘music’ mode’s clearer, more direct approach is preferable for playing music. We play Warpaint’s Love Is To Die, and while suffering from a lack of solidity and dynamics, the clear, crisp delivery carries decent momentum and expression. But like many an LG soundbar before it, the SK8 has some shortcomings we cannot ignore – one of which is a lack of sonic solidity. From speech to Elton John’s piano playing to gunshots out of umbrellas, there’s a hard edge where we’d like more body and substance. This is only accentuated as we turn up the volume. Ultimately, the mid and high frequencies need a good fleshing out. Its dynamic performance – both in terms of range and punch – is also below what we’d expect from a soundbar at this price, meaning climactic moments are often less impactful and rousing than they should be. For optimum performance, we’d recommend experimenting with the sound modes. We prefer ‘music’, which offers a little more focus through the midrange, or ‘movie’, which opens up the soundfield and emphasizes bass. However, these modes aren’t available during playback of Atmos content. Another modern feature of the SK8 is its Google Assistant compatibility. Users with a compatible Assistant speaker, such as LG’s own WK7 ThinQ, can control the soundbar’s playback through voice commands. Music playback can be achieved not only through the direct connectivity of, say, a Blu-ray player (via HDMI or optical) or a portable music player (via 3.5mm input), but also wirelessly over Bluetooth or your home network. Hooking the soundbar up to your internet through ethernet, or wi-fi (via the ‘LG Wi-Fi Speaker’ app), opens doors to streaming from a connected server, or casting the likes of Spotify, Tidal, Deezer and YouTube Music services via Chromecast. The SK8 also supports Spotify Connect. The LG soundbar story is again one of consistency. While it offers a range of fine features and some sonic accomplishments, it ultimately fails to deliver the performance required at this price point. What’s more, it can’t truly justify the Dolby Atmos selling point like its upward-firing-driver-toting SK10Y sibling can. While consistency is often seen as an admirable trait, if LG were to win an award, it would surely hope it was for its reliably class-leading range of OLED TVs instead of its mostly average soundbars.